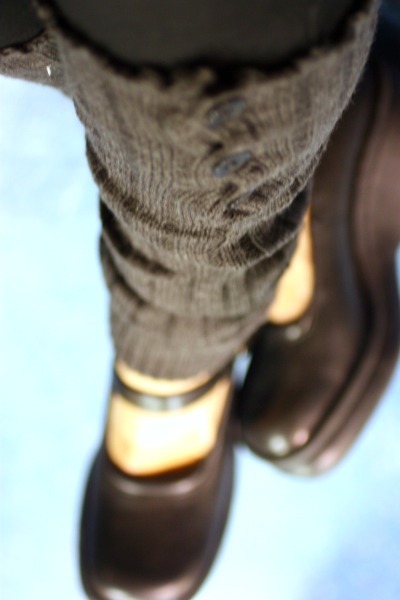 Frugal Fashionista: They’re Back…I Dare You! Rounding the corner at my local Goodwill, I eyed the end cap with a variety of odds and ends. I smirked when I saw something that immediately had my memories rushing to the golden “error” or era of the ’80’s (your choice), where leg warmers were all the rage. 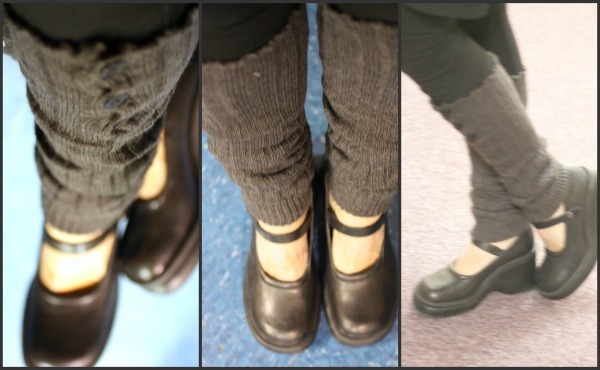 Believe it or not – wearing leg warmers are BACK with a vengeance. Immediately, I informed her of their new found fashion flare, and decide to rock them myself over my T.J. Maxx leggings and thrifted, leather Bass shoes. Have I convinced you yet to reconsider? I’ve been enjoying them with boots, over tights, jeans and under skirts. We’ve had a mild winter here in NC, but they are perfect to add additional warmth in those frigid climates. 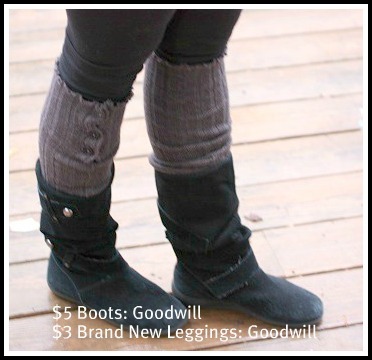 So, my Frugal Fashionista recommendation for the week is to buy some leg warmers, knit some leg warmers, or dig up in your parent’s attic to see just how much of a pack rat they are, and then give this new fad a try. 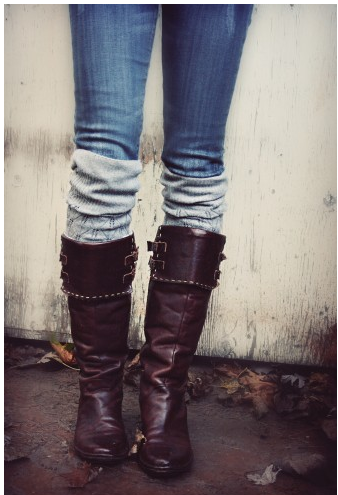 Even brand new, they are an inexpensive accessory that can dress up your thrifted pieces and make a statement. Seriously, I have had so much fun with them. Just dare to be different! I’ve had many requests for another Frugal Fashionsta Fashion show (link up party). Get your frugal fashion posts ready and link up on Feb. 24th. If you don’t have a blog and would like to participate, please email a few pictures of your outfits. Remember that my requirement to link up is that at least 1-2 of your core wardrobe pieces need to be second hand. I took your double dog dare and came over 🙂 LOL haven’t heard that in a while! Girl, I’ve seen that these are back! It’s just been too hot in GA to wear them. You’re looking great in yours! Keep em’ coming!! And thank you so much! Lots of fun!! They look great on you! I don’t know if I can wear them though! I really love the look of the grey pair in the third picture….this could convince me! 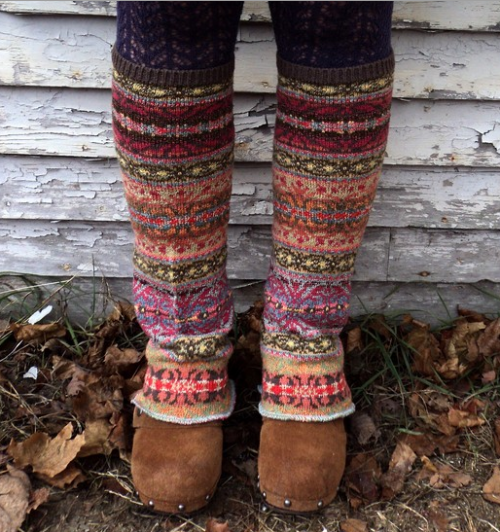 a) you are just adorable… b) question: so I saw some leg warmers — I actually called them boot socks because I’m not sure that I would ever wear them as leg warmers — for a whole $5 at a resale shop. My question is (we’ve had a mild winter, too): will they be in again next winter? Or is this a one season fashion? I bet my mom still has mine from highschool packed away somewhere. I should get on the phone and find out, hm? I have been thinking about getting a pair to wear with my boots. I never owned a pair in the 1980s. Those were one of those luxury items we couldn’t afford growing up. Probably would leave these for my daughter. Since I’m a large size according to your site (size 12)! , I am careful what I wear. Of course after five children and being five foot one, I’m proud to say I’m a size 12! I am a size 12, so I definitely wouldn’t say that is large – very average.If you are referring to the video from two years ago, don’t forget to read the post that went with it. It was a novice video with poor editing, and the size that was handed to me was a 22. I love them under boots!